With bellies full and wine-stained teeth, it’s safe to say that the first weekend of Cornucopia has officially come to a wrap. Now in its 18th year, Whistler’s food and wine festival is a well-oiled machine. The schedule offers a balanced mix of lavish parties, restaurant-hosted lunches and dinners, food and wine seminars, culinary competitions, and even meditation and yoga sessions to counter any effects of overindulgence. 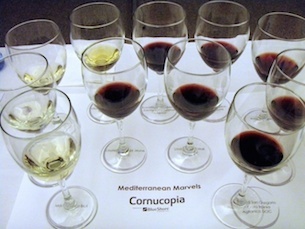 The unofficial kickoff to Cornucopia took place on Thursday, November 6. House Party was the perfect event to build excitement for the rest of the festival, as it offered a little bit of everything. Attendees were handed a wine glass upon arrival and were free to peruse the winery booths, chatting with BC-based winemakers while sampling their finest. It was the perfect way to showcase the variety of wines offered in BC, from Bella’s sparkling wines to Privato’s mouthwatering pinot noir (named Top Red at this year’s Cornucopia). In between sips, food and wine lovers migrated towards the BBQ buffet hosted by the Four Seasons Whistler’s Sidecut restaurant. Plates heaped with brisket, ribs, suckling pig, salmon, and good old mac and cheese only highlighted the event’s distinct lack of pretension – after all, this is Whistler. Attendees capped off the night with apple crumble, cheese, and a few more glasses of wine for good measure. The next three days featured an extensive menu of workshops and seminars. With so many intriguing events happening at once, building a schedule for the weekend was slightly more difficult than plotting out a university timetable. I started with Mediterranean Marvels, a wine workshop that explored some of the earliest wine producing countries on earth. Many of these regions have been making wine for 7,000+ years, yet have waned in popularity relative to many of the “new age” wines. We sampled our way through an eccentric mix of 11 wines from 7 different countries, including Turkey and Lebanon, learning about each region’s particularities along the way. The takeaway: those who are willing to be brave with unfamiliar grapes and regions are often rewarded with spectacular wines at an incredible value. Next, I headed to Made in Italy. As we sampled through the flight of 11 wines, it became apparent that there really is no such thing as a typical Italian wine. We worked our way up to a 2010 Giusti Amarone Classico Superiore, a real treat to sip as our presenters spoke some words of wisdom: buy more than you can drink, or at least try to hide a few bottles so that you can’s find them for awhile. Those who weren’t too wined out continued to celebrate Cornucopia well into the evening, taking in the infamous CRUSH Grand Gala Tasting and a variety of after parties. The Sunday morning seminars were filled with slightly sluggish attendees, but those who braved the headaches were rewarded with some captivating events. My own schedule featured two back-to-back grape-centric seminars. The first, Chardonnay: People-Pleaser Seeks Invitation to Dinner, led us through an hour-long event of country hopping and chardonnay tasting. Starting in the cooler climates right here in BC, we slowly built towards warmer climates, tackling Chablis, New Zealand, Australia, Washington State, California, and South Africa along the way. As the tastings progressed, it became clear how much climate has an impact on chardonnay. The second, Cabernet Sauvignon: Team Player Seeks Long-Term Relationship, featured an equally tantalizing set of wines. We started traditionally in Bordeaux, moving across continents to see how various countries use this grape in different ways. 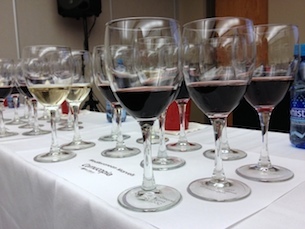 Wines from Chile, Argentina, South Africa, Washington State, California, and Australia could not have been more different from one another, and the differing reactions across attendees made it clear that each wine offers something unique. After a wine-filled weekend, I looked forward to imbibing at With a Twist, an exploratory cocktail event new to 2014. This evening event was slightly more subdued, likely due to the festivities that had already taken place throughout the weekend. We were handed a keepsake glass and set off to roam the booths with five drink tokens in hand. I started and ended my journey at a booth hosted by Galileo Wine and Spirits, sampling a Delamain Cognac at the first stop and an Armagnac Castarede at the last. In between, I tasted George Clooney’s own tequila, a festive ginger crantini, and a delicious gin-based rosemary cocktail. Though the selection wasn’t as varied as some of the larger events, there was still plenty to choose from to suit every palette. And now, Cornucopia fans welcome a few days of rest, which will surely be used to recover just in time for next weekend’s festivities.